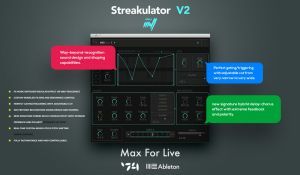 Audiomodern and Strangelines have announced the release of Streakulator V2. 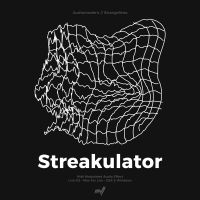 Created by developer Ernesto Cecco D'Ortona, Streakulator is a MIDI-modulated Max For Live audio effect "suitable for modern producers to use in the daily workflow, but it's suitable for many uses, mostly sound design". Its main job is to create crazy sounds with a human touch in no time. 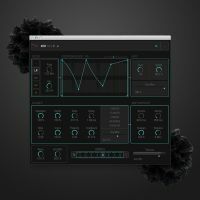 Streakulator is an audio fx for Ableton Live to mangle any sounds source beyond recognition with ease: you can do sidechain, sound design, waveshaping, filtering, wobble and growl basses, synth sounds from any source, heavy metallic effects, robotic/futuristic sounds, synced gating, fast sound shifting with presets automation - it goes as far as your imagination can go. 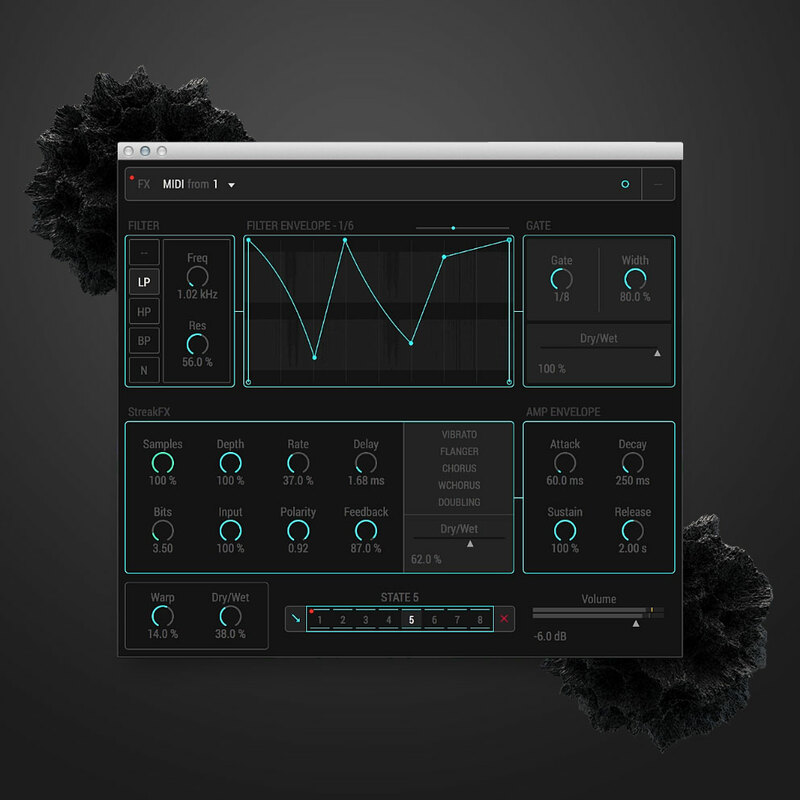 You can use STREAKULATOR with any kind of sound: organic sounds, acoustic instruments, drum loops, synth phrases and vocals too. 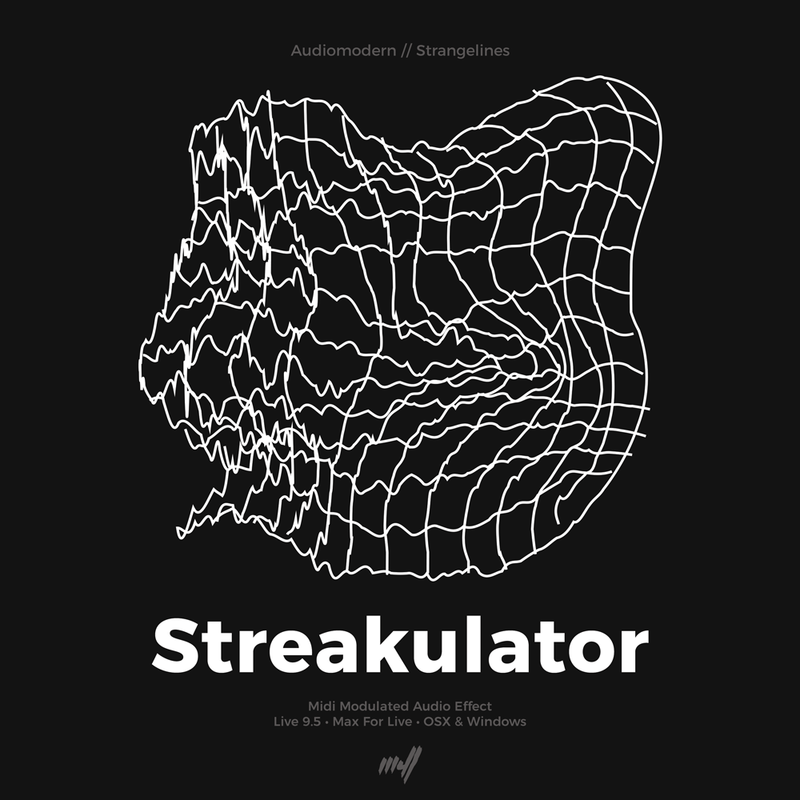 Streakulator consists of two main pieces: the "MIDI to Streakulator" and Streakulator itself. 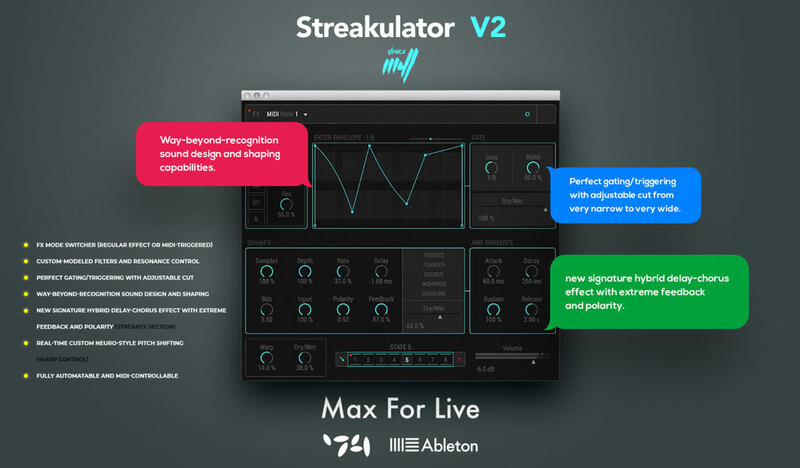 Streakulator is a MIDI-triggered audio effect, therefore it needs MIDI impulses to work, so here comes into play the MIDI to Streakulator: put it in a new MIDI track, put some notes in its piano roll and your MIDI sequence will trigger filters, envelopes and effects in Streakulator. Note that the letter in the "MIDI TO" parameter should be the same in Streakulator's "MIDI FROM". Created by Ernesto Cecco D'Ortona [StrangeLines], user experience professional, sound designer artist and developer, to bring you the premium Max for Live experience. FX mode switcher (regular effect or MIDI-triggered). New signature (custom-modeled) filters and resonance control. Gating/triggering with adjustable cut from very narrow to very wide. New signature hybrid delay-chorus effect with extreme feedback and polarity (StreakFX section). Real-time custom neuro-style pitch shifting (Warp control). Clean, minimalistic, modular, dry/wet-responsive UI. Price: €39 / Free for existing users.